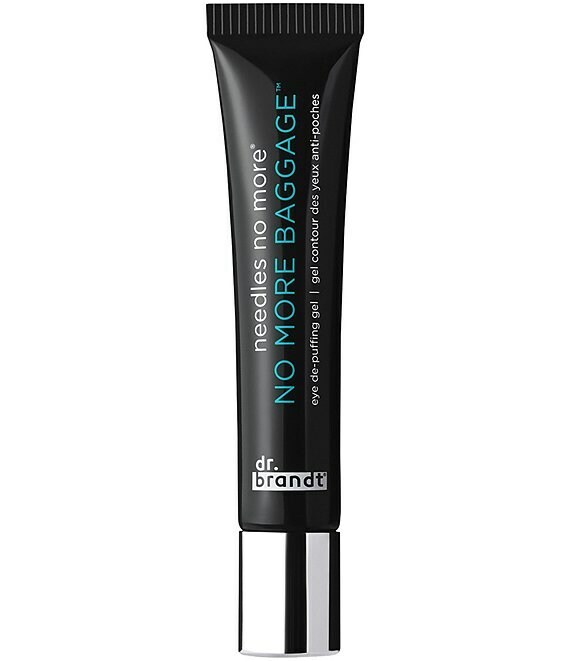 This advanced eye de-puffing gel is a quick, innovative solution for aging, tired-looking eyes. Upon application, it provides a tightening effect and smooths the under-eye contour to visually reduce the appearance of under-eye bags and dark circles for an immediately brighter, well-rested look. It also works over time to help restore a youthful eye contour for a consistently smooth and improved appearance. Dr. Brandt Skincare created its Filmatrix technology that forms an invisible, biomimetic film. Obtained from algae extract, plant extract, and silicates on the skin's surface, it tightens the appearance of the eye contour for a visually smoother eye contour. Peptides also work to restore the look of elasticity and firmness while supporting the skin and helping to reduce the look of bags, puffiness, and brighten the under-eye area. The advanced formula is further enriched with a potent cocktail of antioxidant botanical extracts and caffeine to help reduce the look of puffiness and decrease the intensity of dark circles. On moisturized skin, gently pat directly on bags and dark circles. Use alone or under makeup. Avoid facial expressions until dry.